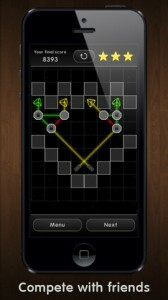 iPhone puzzle game addicts are always looking for a new twist on classic formulas to keep things fresh. 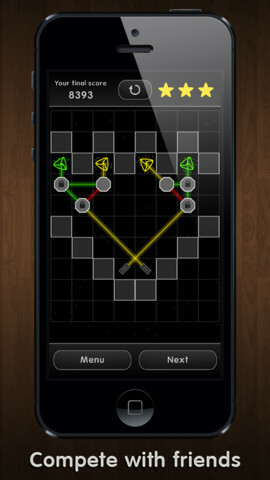 If you’re in a bit of a puzzle rut, then you might enjoyLight Breeze, developed by BenderLab. Light Breeze is a puzzle game that’s all about reflecting beams of light around a grid. By using various lenses and reflecting tools, you will get the light to shine on a given area of the screen. It’s tricky stuff: even when you think you have the puzzle solved, you might need to make several small adjustments. Thankfully, the controls are intuitively designed and responsive to the touch. The graphics are slick, if minimal. The nicest surprise here is the music: it’s kind of jazzy, enjoyable, but still mild enough to make for good background noise during extended play. For just 99 cents, you get 80 levels, which seems more than fair. But in fact, there are more than 80 levels: Light Breeze lets you blow away your friends with levels that you create yourself! 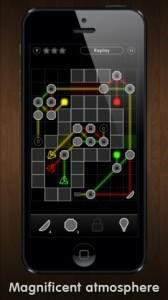 Using Facebook, Twitter, or email, you can share user-created levels with people in your social circle. If you like puzzles but often find yourself getting stuck, there’s good news. 99 cents get you a pack of 4 solutions, or drop $4.99 and get unlimited solutions! 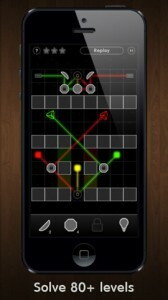 With additional levels coming in future, regular updates, Light Breeze is a great app to invest in. It’s cheap, has a ton of content, and looks even better than it sounds. 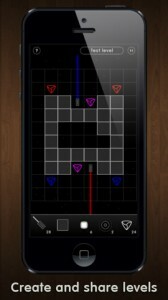 Reasonably priced, yet unreasonably fun: Light Breeze is an unexpectedly engrossing iPhone puzzle game that’s sure to entertain puzzle fans of all ages. Light Breezeis compatible with iPhone 3GS, iPhone 4, iPhone 4S, iPhone 5, iPod touch (3rd generation), iPod touch (4th generation), iPod touch (5th generation) and iPad. Requires iOS 4.0 or later. 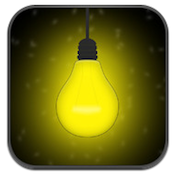 This app is optimized for iPhone 5.A small expedite fee was paid by the developer to speed up the publication of this iPhone app review.